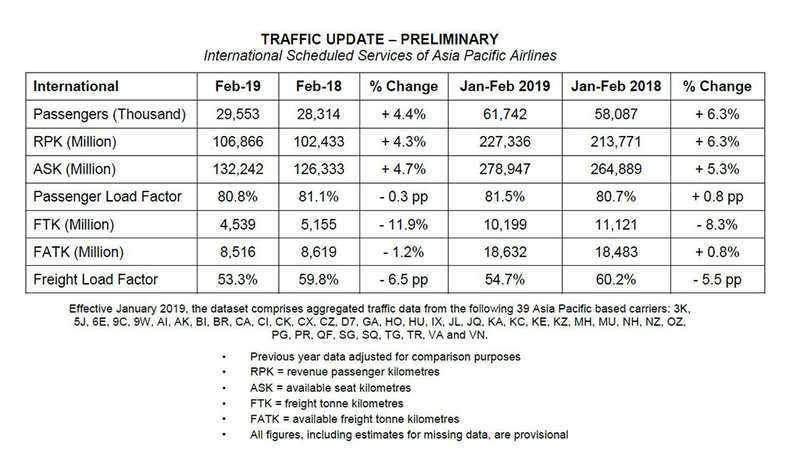 Asia Pacific airfreight markets recorded “steep declines” in February according to preliminary figures issued by the Association of Asia Pacific Airlines (AAPA). The association saw the “prevailing weakness” in air cargo markets “further aggravated” by the closure of businesses during the region’s holiday period. Said an AAPA spokesperson: “Air cargo markets recorded steep declines in February, as demand in freight tonne km (FTK) terms saw a double-digit fall of 11.9% compared to the same month last year. “Weakness in export activity was driven by slower demand from major advanced and emerging market economies, including China. The fall in demand vis-à-vis the 1.2% contraction in offered freight capacity led to a significant drop in the average international freight load factor, by 6.5 percentage points to 53.3% for the month. In contrast, the number of international passengers carried by the region’s airlines climbed 4.4% higher in February, on top of the strong growth recorded during the same month last year. Andrew Herdman, AAPA director general, said: “Passenger demand remained relatively steady, supported by competitive air fares and overall economic growth. “Conversely, air cargo markets experienced challenging conditions. Declining confidence levels contributed to further falls in new export orders, adversely affecting demand for air shipments. Looking ahead, Herdman added: “The slowdown in the manufacturing sector with the ongoing softening in trade sentiment point to the likelihood of continued weakness in air cargo markets in the coming months. He continued: “Stimulatory fiscal policies implemented by selected economies are expected to encourage domestic spending. This should support reasonable growth in the global economy this year, sustaining continued growth in air travel markets.